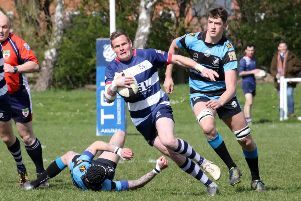 Banbury Bulls lost more ground on Wadworth 6X South West One East leaders Old Patesians after slipping to their second defeat of the season at Royal Wootton Bassett. Despite tries from Joe Mills, Pete Boulton and Jimmy Manley it wasn’t enough to prevent Bulls going down 24-17 in Saturday’s fixture at Malmesbury Road. Matt Goode’s now trail Old Patesians by eight points but remain second by a single point from Chippenham. Bulls started brightly and were encamped deep in the 22, a rolling maul was pulled down and the penalty count rose before Sam Robinson was shown a yellow card. But strong defending eventually paid off with a turnover allowing Wootton Bassett to clear their lines. Bulls took the lead with arguably the best try of the match with a fluent move from the backs straight from the traning ground. George Grieve drew two defenders before slipping the ball to Tommy Gray who drew the last man before releasing Mills and he touched down in the corner. Wootton Bassett got in front when a cross-field kick caused confusion. Strong defending kept the hosts out but the ball was recycled and the returning Robinson touched down with Ieuan Clements converting. The hosts increased their lead after good work from the forwards. Chris Rowland gathered a loose pass and, with help of his forwards, drove over from short range. Bulls narrowed the gap shortly before halftime. Angus Johnson did a brilliant job to turnover a line-out five metres from his own line but the pressure paid off and Boulton bundled his way over in the corner. After the restart, Bulls conceded several penalties as Wootton Bassett upped the tempo and eventually the visitors’ defence gave way with Rowland crossing for his second try from close range. Wootton Bassett increased their lead when the ball was kicked through and Mills appeared to touch down for a drop-out but the referee indicated he had carried it into the in-goal area first. From the resulting scrum Robinson bundled his way over and Clements converted to make it 24-10. Bulls scored a late try to narrow the gap in the closing stages. Grieve broke down the left before drawing the last man and playing in Manley who out-sprinted the covering defence to touch down wide to the left. Mills frantically converted but that proved to be the final action of the contest.